About 11 months ago, I did a whole series dedicated to building my dream workspace -- something that was an impossibility at the time. I sort of can't believe that less than a year later I've pretty much brought that vision to life. I work primarily from home these days, but because my job situation is still a part-time gig, I've been able to spend loads more time working on projects for the blog and other sites. This adds up to spending most of my waking hours in this room, so I guess it's a good thing I love it, no? Read on for the full tour. 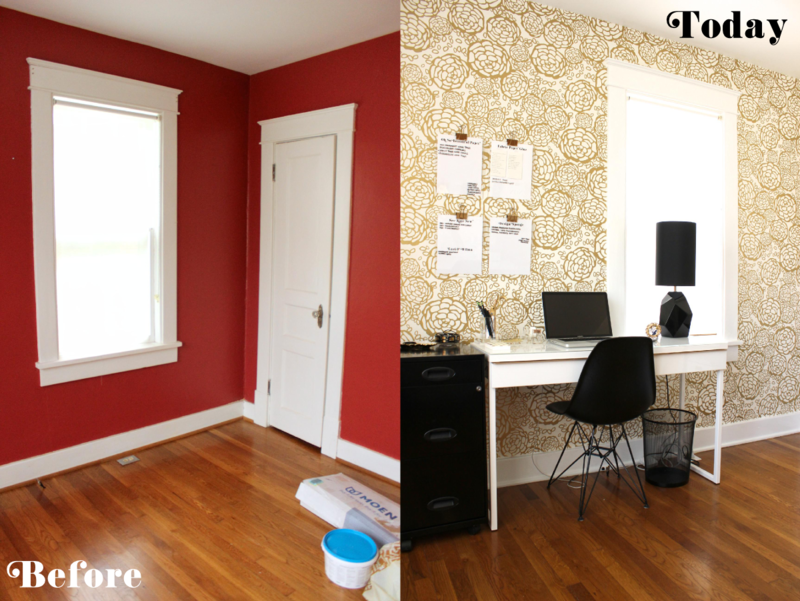 The room that became my workspace was once a dramatic red. Again, my dad created a blank slate for me with Valspar's Ultra White. 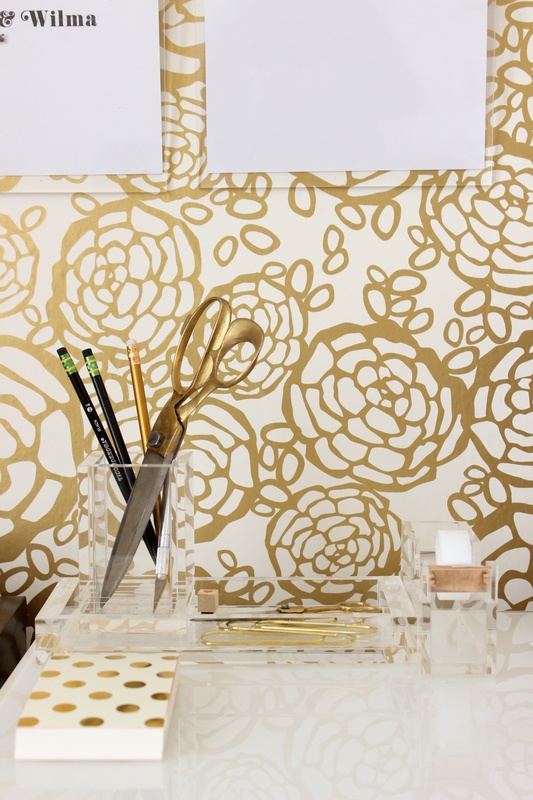 Then, after considering a number of options, my dad and I wallpapered an accent wall in the gold and white Petal Pusher paper by Oh Joy for Hygge & West. It wasn't completely without its challenges, but honestly, installing it wasn't all that difficult. I added a few fancy acrylic desk accessories (true story: the pencil cup and tray are just bathroom accessories from Home Goods). 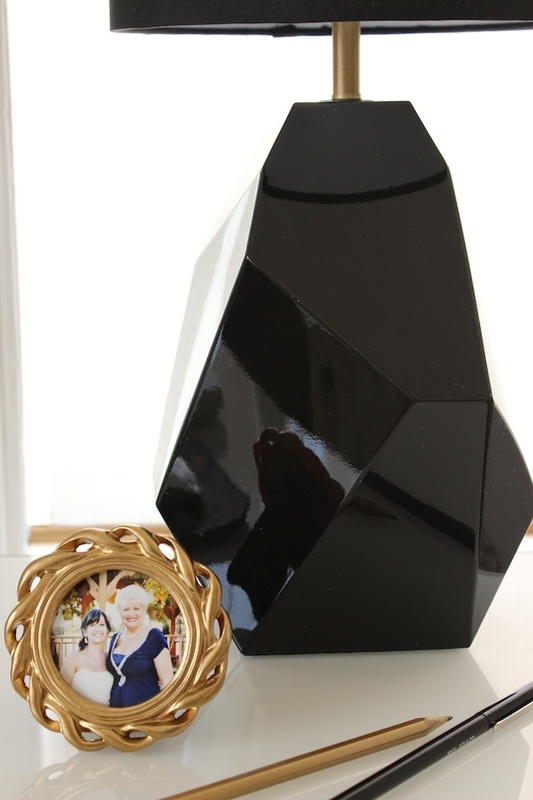 The black faceted lamp was a steal from J.C. Penney (but no longer available, I see). I've been using my DIY gold + acrylic clipboards like crazy. In addition to the normal clipboard functions, they pull some pretty impressive double duty as dry erase boards to help me keep track of ideas. 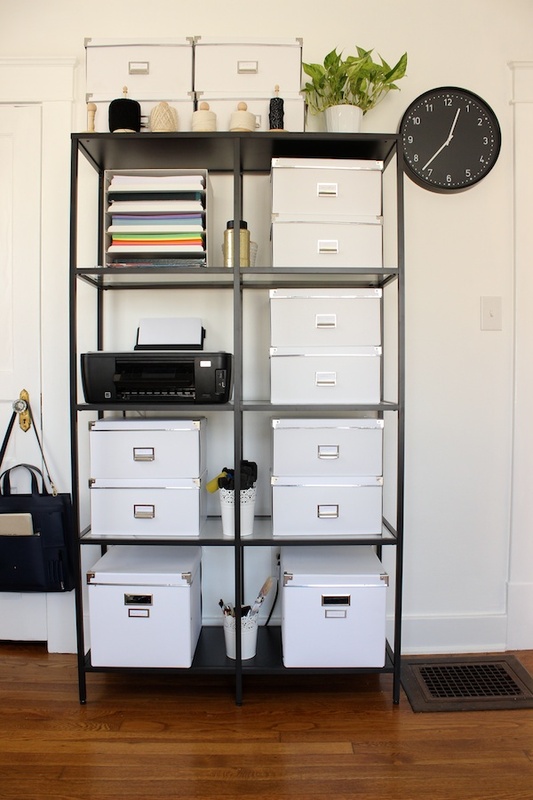 The building blocks of this room are basically one big ode to Ikea. Seriously, can't beat 'em. All my supplies are wrangled by the VITTSJÖ shelving unit, the KVISSLE letter tray, and a boatload of white KASSETT boxes. My computer desk is the BESTÅ BURS with a glass top, and my sewing/project table is the LINNMON top - LERBERG legs combo with some added, mobile storage from a spraypainted RÅSKOG cart. Finally, the curtains are uber-cheap HILLMARI panels with a little black pom pom trim added. Although my original plans called for a rug, in the end, I decided it wasn't the most practical addition to the space. Perhaps it's the condo to blame, but I do my best crafting on the floor, so it's nice having this big, hardwood expanse in the middle of the room for making easily swept-away messes. That serger is a new addition to my collection of DIY tools -- an amazing gift from my dad. The art is a lovely gold-leafed print by Luciana Martinez. The shelves are a DIY I'll share soon and are perfect for keeping my collection of twines and spraypaint. Seriously, though, I used to be able to buy Montana Gold spraypaint from my local Michael's store, but here in Nashville, they don't carry it. So I recently ordered a little stockpile of it, and not only is it my favorite spraypaint, it's pretty enough to display, no? ...speaking of spraypaint, there were a lot of items in this room that got a nice little coat of it. 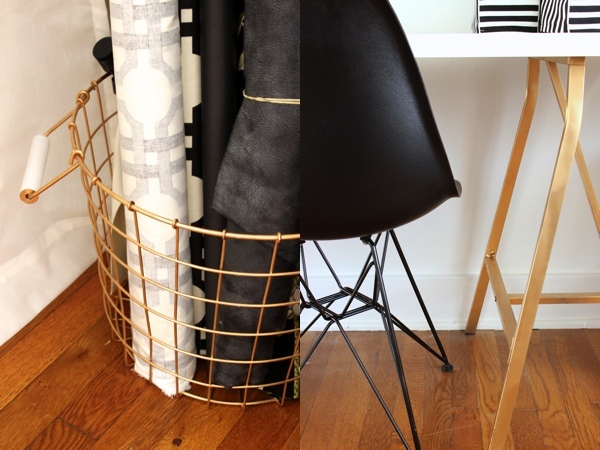 A couple of white metal baskets from Home Goods got a gold makeover. Like many a DIY blogger before me, those Ikea table legs also got some gold. My Eames Eiffel-style chairs were a stupid, stupid deal (I'm talking $20 for both) from a local store called Essex/Bargain Hunt (local peeps: don't knock it till you try it). Their once chrome legs got a couple of coats of black. The rolling cart was transformed from grey to black. 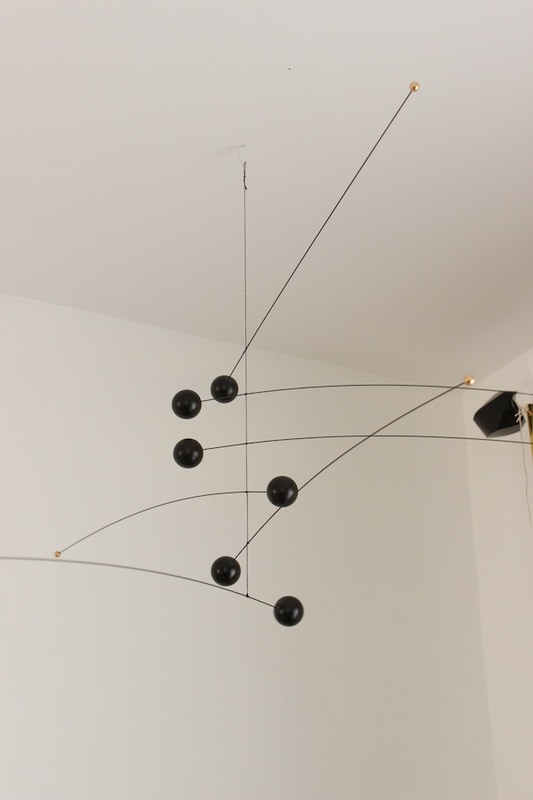 Even the little tips of my Calder-style mobile went from red to gold. I just love this room so, so much. It's a luxury in so many ways for sure, but I am certainly appreciating every square inch of it! Amazing room!! It's perfect! 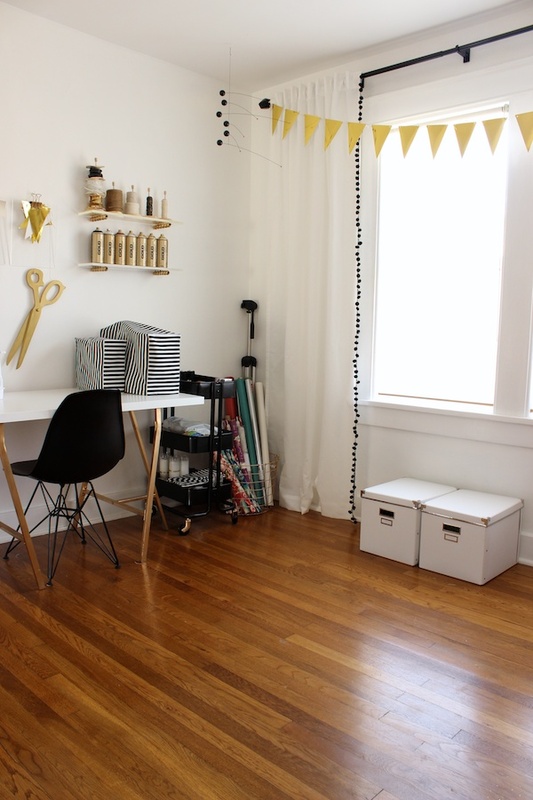 Did you make the sewing machine/serger covers? If so, any tips on making my own? Hey, Heather! I did make those covers. They were a pretty quick project. They're essentially just sewn cubes with the bottom hemmed. My approach was not unlike this one, although I didn't even make mine narrower at the top. I love Bargain Hunt. Also, I fully expect to someday see this floor look like the one at Old Made Good. I've never been there! But um, yeah, I accidentally gold leafed a little part of them the other day, and Michael wasn't pleased. So I've got to be at least a little careful. 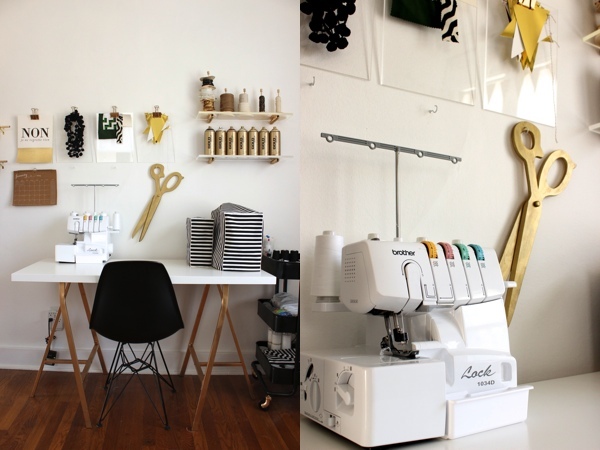 I have been waiting for this reveal, and I literally gasped when I saw that you have a serger now. I'm jealous. The room looks amazing. Gahhhhhhh! Obsessed with it all! 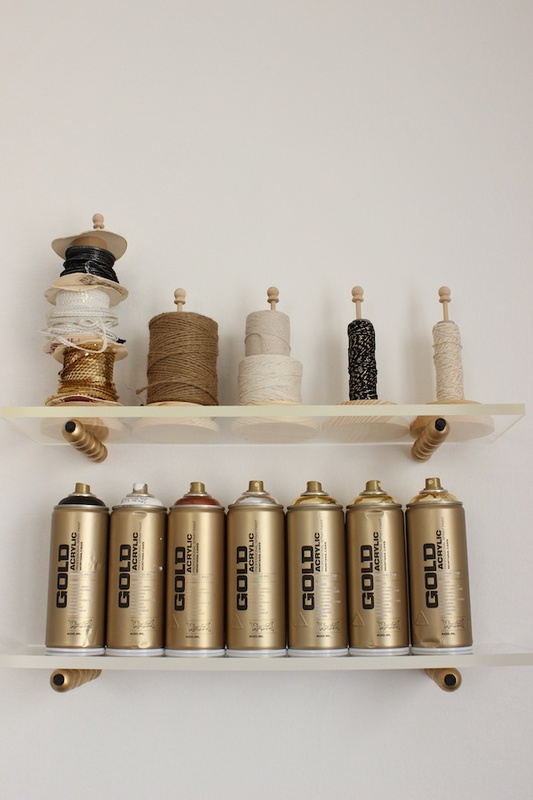 From the wallpaper to the chairs to the shelf FULL of the best spray paint in the world. Congrats, lady, for making your dream space into a reality. It is the best spray paint in the world, and I probably only came to know that because of you. And every time I look at it, I think of you. Is that weird? Yes. It is. PS did you make those sewing machine covers??? That wallpaper, I must have it!! I know! The first time I ever laid eyes on it, I said the same thing. Even after considering other options, it was the clear winner. Gorgeous Mandy!! And I got that same serger last year, I love it!! So that's where that gorgeous wallpaper went ;) I love it, Mandy! It's SO beautiful. The chairs. Oh the chairs! 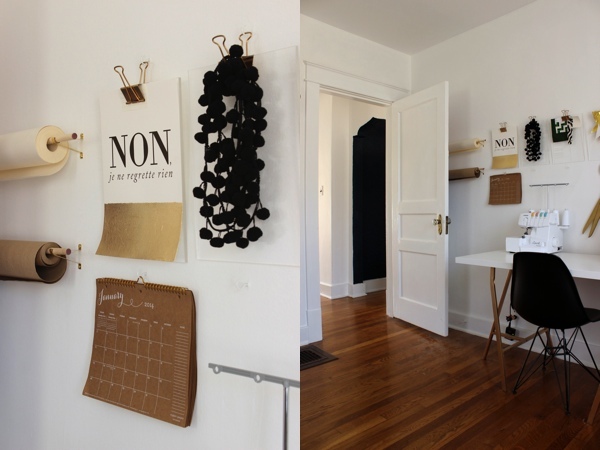 You did an amazing job of turning many simple pieces (epecially oft-used IKEA items) into a special room. 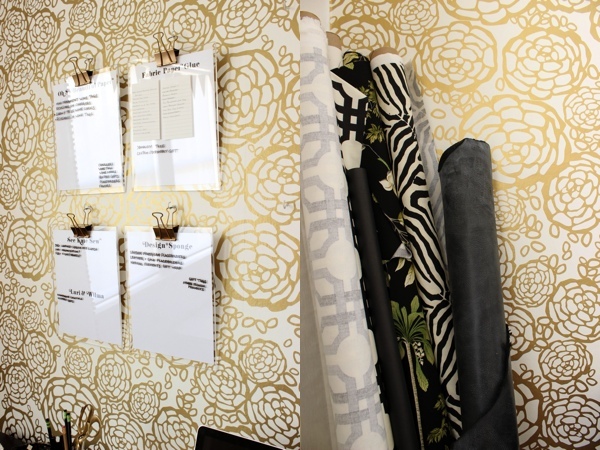 The wallpaper certainly shines, and all the touches of black, white and gold pull the room together. Why can't I ever find anything good at JcPenney? I walk through their home section now and then and never find anything. Honestly, I never find anything good at JCPenney when I go in person. It's all about the online shopping!